Wed., 4 Mar. - Thu., 5 Mar. Thu., 5 Sep. - Fri., 6 Sep. Mon., 9 Dec. - Wed., 25 Dec.
Fri., 3 Jan. - Thu., 9 Jan. Sat., 26 Oct. - Wed., 6 Nov. Thu., 12 Dec. - Sun., 22 Dec. Sun., 29 Sep. - Wed., 23 Oct. Mon., 24 Feb. - Mon., 2 Mar. Sun., 26 Jan. - Sun., 9 Feb. Mon., 29 Jul. - Mon., 5 Aug.
See all 873 properties in Queen Beatrix Intl. 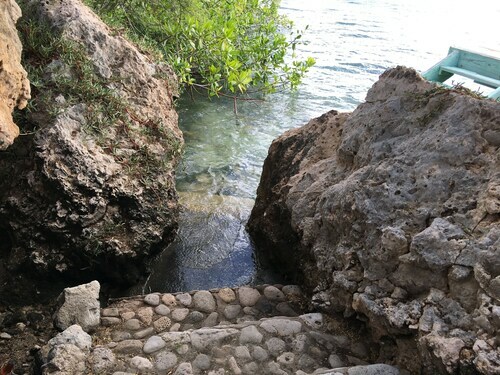 Situated by the ocean, this romantic property is 1.1 mi (1.8 km) from Guillermo Prospero Trinidad Stadium and within 3 mi (5 km) of Aruba Town Hall and Renaissance Mall Aruba. Cas di Cultura Theatre and Cultural Center and Surfside Beach are also within 2 mi (3 km). 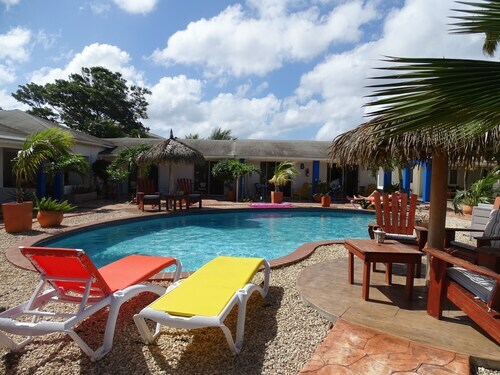 Situated in Oranjestad, this apartment building is within 3 mi (5 km) of Guillermo Prospero Trinidad Stadium, Cas di Cultura Theatre and Cultural Center, and Hooiberg (Haystack Mountain). Surfside Beach and Beth Israel Synagogue are also within 3 mi (5 km). Situated on the waterfront, this apartment building is 3.1 mi (4.9 km) from De Palm Island and within 6 mi (10 km) of Guillermo Prospero Trinidad Stadium and Cas di Cultura Theatre and Cultural Center. Surfside Beach and Wilhelmina Park are also within 6 mi (10 km). Situated in Oranjestad, this aparthotel is within 3 mi (5 km) of Hooiberg (Haystack Mountain), Aruba Town Hall, and Renaissance Mall Aruba. Guillermo Prospero Trinidad Stadium and Casibari Rock Formations are also within 2 mi (3 km). 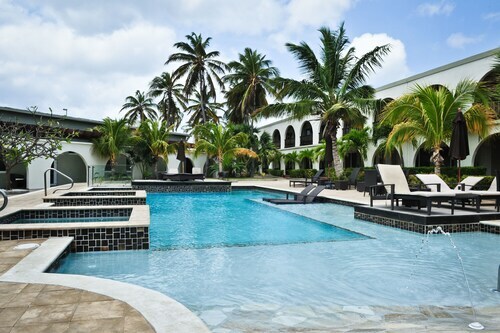 Situated in Oranjestad, this property is within 6 mi (10 km) of De Palm Island, Mangel Halto Beach, and Aruba Town Hall. Renaissance Mall Aruba and Blue Parrotfish Water Park are also within 6 mi (10 km). With direct access to the beach, this Oranjestad hotel is within 1 mi (2 km) of Surfside Beach, Aruba Town Hall, and Renaissance Mall Aruba. Links at Divi Aruba is 3 mi (4.8 km) away. 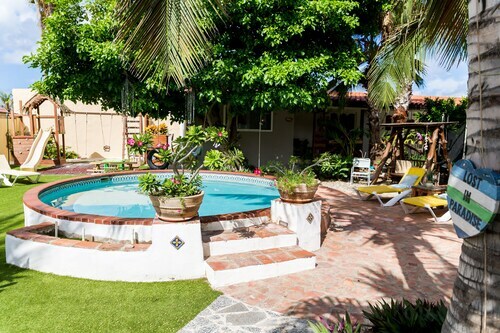 Situated in Oranjestad, this vacation home is close to Cas di Cultura Theatre and Cultural Center, Guillermo Prospero Trinidad Stadium, and Surfside Beach. Local attractions also include Aruba Town Hall and Renaissance Mall Aruba. Question : How long does it take to fly from Toronto to Aruba? Answer : When flying from YYZ to AUA, it will take five hours and one minute on average. Remember, there is a one hour time change. Answer : The cheapest day to fly from Toronto to Aruba is on Thursday. If you want to save a little cash on your next getaway look for flights on that day. Question : How much is a plane ticket to Aruba (AUA) from Toronto (YYZ)? Answer : Cost can range anywhere from $396 to $3,960, prices for YYZ to AUA do change a lot more than the majority of routes from Canada. Prices are usually lower the further out you book. Question : Which airline has the least delays from Toronto to Aruba? Answer : Booking with WestJet means you will arrive to Aruba pretty close to the time your ticket states. In fact, this airline has an 80% on-time average. It never hurts to be prepared. If you should choose this airline, be sure to track the flight status to stay on top of the departure time. Question : How much time do people spend in Aruba? Answer : The average time spent sightseeing in Aruba by passengers from Toronto is about one week. However long you decide to stay, give yourself plenty of time to see what makes Aruba fantastic. 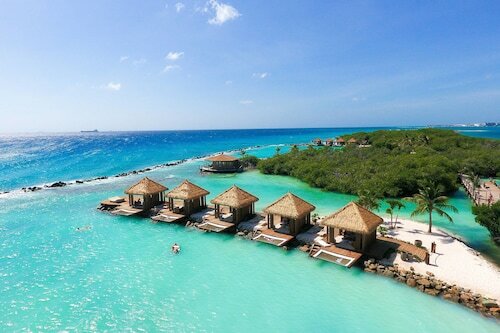 Question : What is the cheapest date to fly to Aruba? Answer : If you are needing to save moolah, look at May 1st. As of Apr 15th, it's showing the cheapest ticket at $396. That is 50% below the average for this route, so you can spend that extra dollars on some souvenirs while in Aruba. Question : How many flights are there per day from Toronto to Aruba? Answer : Depending on the day of the week, the number of flight times will change, but on average there are two. That is lower than the national average of six. Not happy with increased charge for advanced seat selection including extra charge for window & aisle seating. There should not be a luggage charge for a trip to a holiday destination such as Aruba. Nobody goes there without a suitcase. Very impressed with the Flight attendants and the amazing service they provided! On time, arrived 40 minutes early! Personal bag was wet when leaving plane. Something must have spilled on floor under seat. We love Westjet. Such a great stress free experience every time!